Previously I wrote about how blockchain is being developed for a decentralised transportation system, and that MAAS services would begin to take a more prominent role in society. Urban public transportation will become increasingly complex and crowded in the future, as the importance of mobility services like Uber and Lyft grows (with an estimated $69 billion, and $7.5 billion net worth respectively), and more companies look to leverage self-driving cars to launch autonomous ride-hailing services in cities. Carmakers will soon see their core business model swing from private car ownership to subscription access to a suite of transportation options. Today’s ride-sharing technology do not rely on IoT connected cars. Instead, they rely on smartphones that connect drivers with riders. Uber and Lyft, which stand out as the most popular ride-sharing companies, serve millions of people every day. 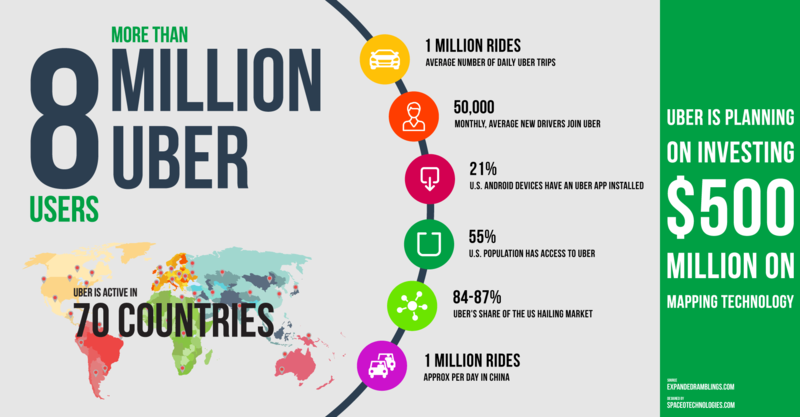 One estimate shows that Uber gives rides to about 40 million people each month worldwide. Lyft provides about 14 million rides per month. According to various sources, currently there are over 300+ decentralised ride-sharing services globally. Below I have briefly mapped out some leading companies who are operating in this space. San Francisco-based Uber is by far the most popular operating a mobile-app based ride-hailing service with reportedly over 1.5 million drivers (2017) in over dozens of nations and reportedly worth over $69 Billion. The app enables customers to secure and then submit their trip requests. With Uber, you can even get a private car, taxi or ride-share from your cell phone. This connects you with drivers within just short minutes. You can use the Uber app in different cities all over the world. You can request a ride with ease and pay through your phone. Uber is one of the best ride-sharing companies that guarantee reliable pickups, one tap ride and clear pricing. As the first ride-sharing company on the scene, Uber has established itself in the ride-sharing market as the dominant player. Last year it got over $1 billion in venture capital funding, which means it is not going anywhere any time soon. Uber provides several levels of service, giving riders the option to choose from normal cars all the way up to high end-SUVs with commercial drivers behind the wheel. Uber encourages drivers to be as professional as possible, so you can expect your driver to open the door and usher you into the back seat of the vehicle. This professional standard has allowed the company to take a dominant foothold on the professional transportation market, becoming especially popular among business people and young professionals. Lyft, the second-largest ride-hailing app by volume, offers transport in over 200 U.S. cities including New York City, Los Angeles, and San Francisco. The company was founded in 2012 by Logan Green and John Zimmer and is valued at $5.5 billion. Like most conventional ride-sharing apps, Lyft matches riders with drivers with the press of a button, and includes GPS tracking to they can see exactly where their driver is. Lyft is really transforming the way communities and people connect via better transportation. Lyft is a privately held American transportation company with an exclusive mobile application facilitating peer to peer ride-sharing by means of connecting passengers who are in need of rides from drivers with available cars. If you need a ride, this ride-sharing company can give you a memorable and welcoming one. Just request for a ride in Lyft app and then get picked by highly experienced drivers within a few minutes. With just a single tap, you will be matched with background-checked and friendly drivers. Get to your destination fast, safe and sound with Lyft. There are different options to ride when you choose this ride-sharing company; they include: The regular Lyft, Lyft Line and Lyft Plus. Lyft is known for their down-to-earth approach, encouraging riders to ride in the front passenger seat so they can talk to the drivers. The company is known for their signature giant pink mustaches, making the cars easy to spot, and a great conversation starter. Passengers are greeted with a fist bump, which breaks the ice and sets the standard for the ride. Via Transportation, Inc. also known as Via is a privately held American transportation network and real-time ridesharing company based in New York City. The company was founded in June 2012, by Daniel Ramot and Oren Shoval, the company's mobile-phone application facilitates group travel for a flat rate. Via operates in the all five boroughs of New York city, areas of Chicago, and Washington DC. The company's technology is used in ridesharing projects in Paris, United Kingdom, and Austin, Texas. Unlike Uber and Lyft, the routes are static — you simply tell the service where you’d like to go and you’ll get dropped off at a nearby location along the way. These static routes mean that you’ll often have to walk a block or two to reach your pick-up location, but Via’s reservation system doesn’t preclude you from bringing a friend or two. The app also automatically finds cars with the necessary seating, and each extra member in your party rides at half price. Via announced a partnership with Curb to carpool with others in New York City’s yellow cab. The service is offered through Via and Curb, allowing New York’s taxi drivers to move more passengers, which reduces emissions, and users to pay less. Chariot is a San Francisco based company which was set up in 2014 and is owned an operated by Ford Motors. Chariot crowdsources & operates transit routes faster and more reliable than public transportation and more affordable than taxis and ride-sharing. New users get their first week free and can book rides for as little as $3. New users get their first week free and can schedule rides for as little as $3. Currently, this ride-sharing organisation has been bought out by Ford which plans to offer bike ride-sharing services along Chariot. Chariot is dedicated exclusively in the Transportation sector and sets itself apart from competitors with a tailor fit user experience worthy of recognition. Users who want to find out more about Chariot may accomplish this by following the URL to gain a better understanding of company operations and services. Carma Carpooling isn’t like traditional carpool technology that makes people plan days or weeks in advance. Instead, everything is done in real-time, right when it’s needed, right now. The Carma app allows commuters to search for other users going their direction and create a real-time carpool. Later, they can choose to make the return trip with the same person or make a brand new real-time carpool with someone else. The company has set itself apart by trying to appeal specifically to work trip commutes. After getting the car you're sharing, you just start the app and it begins logging your journey. Using Carma, riders and drivers share the cost of commuting through an automated micro-payment transaction based on the distance of the trip taken. Once the rider has been dropped off, $1 plus $0.20 per mile traveled will be deducted from the rider’s Carma Carpooling account and 85% of that will be credited to the driver (capped at $0.55/mile). This makes payment safe, secure and fair. Turo, formerly RelayRides, is a company that operates a peer-to-peer carsharing marketplace. It allows private car owners to rent out their vehicles via an online and mobile interface. The company notifies you if someone wants your car, but the owner has complete control, and it even has its own insurance. Relay Rides also offers service at airports now — in select cities, you can just leave your car there. 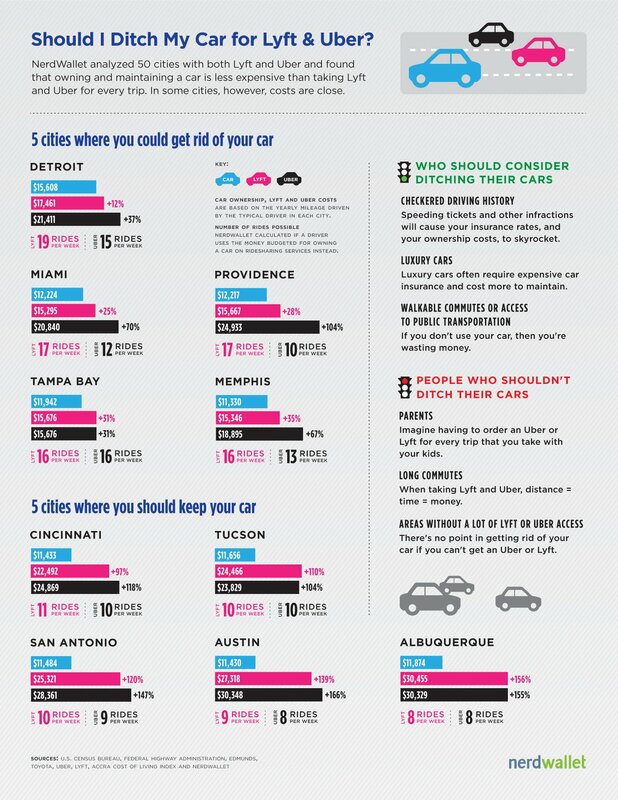 And if you are the one needing a car, it's often much cheaper than renting from Enterprise or Zipcar, for example. Sidecar is another ridesharing service that you can use when someone near you is headed in the same direction. Drivers set the price themselves, and it's usually much cheaper than Lyft and Uber — and you pay with the app. Drivers are pre-screened, the rides are GPS-tracked, and covered by insurance. Sidecar is different from Uber and Lyft in the way the pricing structure works. Sidecar allows users to set their own pricing, and offers up-front pricing so you know exactly what you will pay for a ride. There is no Surge pricing or Prime Time; what you see is what you get. If you are concerned about your budget, this is the ridesharing service that can provide you with an affordable and cost-efficient ride. Sidecar provides users with discounted rides that don’t include compromising quality and the convenience of customers. Getaround is an online car sharing or peer-to-peer carsharing service that allows drivers to rent cars from private car owners, and owners to rent out their cars for payment. Owners set their rental prices and earn a 60% commission from their rental revenue. Getaround launched in May 2011 at the TechCrunch Disrupt conference. To date, the company has received $103 million USD in venture funding. The company currently operates rentals in Boston, Chicago, New Jersey, Portland, San Francisco Bay Area, and Washington D.C. Similar to other car sharing services such as Zipcar, Getaround utilizes the economic principles of collaborative consumption. However, the peer-to-peer rental model doesn’t require the company to maintain a fleet of vehicles; rather, owners manage and maintain their own vehicles. JustShareIt is a peer-to-peer car rental and car sharing marketplace. It allows individuals to rent vehicles directly from individual car owners or car sharing companies in local neighborhood locations or wherever they are traveling. It allows its members to rent the vehicles by the hour, using their smartphone. As with companies like Airbnb, TaskRabbit, and Zipcar. JustShareIt is considered to be a service provider in the Sharing Economy. Car rental companies can also list their vehicles on JustShareIt.com. Car rental company vehicles for rent on JustShareIt.com are of two types: Express and On-Demand. Express car rentals allow a JustShareIt member to secure a vehicle from JustShareIt's car rental partners without the need for completing any paperwork at the rental counter; the JustShareIt member simply retrieves the key from JustShareIt's car rental operating partner. On-Demand car rentals allow JustShareIt members to reserve and unlock an unattended car rental by using the JustShareIt mobile app. JustShareIt's mobile app communicates directly with the company's in-vehicle telematics device in the car. Zimride by Enterprise connects inter-city drivers and passengers through social networking student rideshare program in the United States. The service has over 350,000 users, and is active on 125 university campuses, with partnerships with Facebook and Zipcar and ride payouts made through PayPal. Zimride is a fun and easy way to share the seats in your car or catch a ride. With Zimride, you can find friends, classmates, and coworkers within the University who are going the same way you are. If you have a car, split costs by offering rides. If you don’t have a car, find rides where you need to go and offer to help pay. Students and corporate users simply create a profile using their credentials, and can search for open seats or post their ride and destination on a secure and private network. car2go is a is a fleet of eco-friendly Smart German car rental company. Car2go is a subsidiary of Daimler AG providing carsharing services in urban areas in Europe, North America, and China. The company offers exclusively Smart Fortwo and Mercedes-Benz vehicles and features one-way point-to-point rentals. To join Car2Go, you must register online to receive a card in the mail that allows you to use the service in any of its cities in the North America and Europe. It requires a one-time fee of $35, plus the cost of the time you spend in the car (150 miles are included in the trip in the US). Users are charged by the minute, with hourly and daily rates available. The service forgoes the typical centralized rental office, and cars are user-accessed via a downloadable smartphone app wherever they are parked. As of July 2017, car2go is the largest carsharing company in the world with 2,500,000 registered members and a fleet of nearly 14,000 vehicles in 26 locations in North America, Europe and Asia. Founded in 2011, Grab (formerly known as GrabTaxi) is a ride service company that operates in Southeast Asia, primarily in Malaysia, Singapore, Thailand, Vietnam, Indonesia, and the Philippines. The Grab app works mostly the same as how the Uber app works, and also has a rider-matching feature. It’s easy to use, affordable for many people, and is as reliable as they come. Grab has raised a total of $1.44 billion in total equity funding, with roughly 75,000 registered taxi drivers in its network. Their mission is simple. Grab “aims to revamp these local taxi markets by introducing simple, cost effective mobile-based technology to both the supply (dispatch companies) and demand (passenger) sides of the distribution chain…[their] vision is to revamp the South East Asian taxi industry, making it a safer and more efficient means of transport we can all be proud of.” In December the company announced last December, Grab joined in an alliance with Lyft, Didi, and Ola, India’s main ride-hailing company, in order to compete with Uber as well as grow beyond its Southeast Asia market. Book a ride in 2 taps: Key in your pick-up and drop-off locations to get your estimated fare. Get a driver: Grab will find you the nearest driver available. Track your driver: Know your driver’s location and estimated time of arrival in real-time. Arrive Safely: Share your trip details with loved ones for added safety or even just to let them know you’re on your way. GoJek, is one of the top ridesharing companies in Indonesia. The unique thing about this app is it allows riders to book a motorbike taxi, which is a popular transportation method in the country due to the heavy traffic. The company is valued at about $5 billion as of February, 2018. Go-JEK aims to improve the welfare of workers in various sectors in Indonesia. Basically, they want to innovate, provide safe rides, and allow people to make money on their own time. Go-JEK is genuinely providing a new and unique way to bring about change in the country, beginning with drivers. It’ll be cool to see where they go from here. Based in Brazil, EasyTaxi is also one of the most popular ridesharing companies at the moment. Rather than competing with the rideshare companies directly, EasyTaxi is “the number one taxi solution for consumers and businesses in 170 cities worldwide”. Their tagline, “Your ride, one touch away” basically says it all. This e-hailing app is currently available in 12 different countries, and active in 170 cities including Argentina, Bolivia, Brazil, Chile, and Colombia. With EasyTaxi, riders can book a taxicab in real-time, and track, pay and use the taxi like they would a rideshare vehicle. But rather than individuals using their own cars, this service uses real taxis. Founded in 2014, Hitch-a-ride is the top ridesharing app in Australia. With this app, passengers can connect with their friends via social networks, allowing riders to share rides with other riders they know. This is a very similar concept to what Ridester originally started as; simply a platform connecting people needing rides with drivers going in the same direction. Payment: Hitch-a-ride payments are done directly between rider and driver. Negotiate the rate you want upfront, and make sure it’s clear before taking a ride with somebody. Commute with others: Riders can easily set up group trips, sharing the vehicle with others. This saves money and adds to the fun of the ride. Travel newsfeed: Take a look at the “Travel Newsfeed” which looks similar to a social network. It’s easy to use, and is dedicated to “getting around with the most recent information, requests and options at the top of the screen”. Didi Chuxing, only 5 years old already has operations in over 400 Chinese cities and counting. About 80 percent of taxi drivers in China currently pick up passengers through the Didi app proving itself a worthy Uber rival. Didi Chuxing, (formerly called Didi Kuaidi) is a leading ridesharing provider, offering a full range of commuting options to 400 cities in China. Valued at $35 Billion at the moment, the local company has proved to be a serious threat to Uber – stopping them from having the comfortable dominance that we have seen in many other countries. The company offers a full range of mobile tech-based mobility options for close to 300 million users across over 400 Chinese cities, including taxi hailing, private car hailing, Hitch (social ride-sharing), DiDi Chauffeur, DiDi Bus, DiDi Test Drive, DiDi Car Rental, and DiDi Enterprise Solutions. Started as an online cab aggregator in Mumbai and founded on the 3rd of December 2010 by Ankit Bhati and Bhavish Aggarwal. Ola is an app-based transportation company and is one of the fastest growing businesses in India. It has raised $1.67 billion in equity funding through 10 rounds from 23 investors. Ola currently has over 550,000 drivers in its network across 22 cities, and is Ubers largest rival. Reserved through its mobile app, the company provides different types of cab services ranging from economic to luxury travel. Ola supports both cash and digital payment options with Ola money. It also recently rolled out two news services: outstation and rental. Outstation allows customers to book a cab two hours in advance for intercity travel, while rental lets customers rent a car on an hourly basis. Like Lyft and Grab, Ola has partnered with Didi Chuxing in what is turning out to be quite the international effort against Uber. Together, the four companies rolled out joint products last year, beginning with Didi riders who, when visiting the U.S., can open their Didi app to hail a Lyft. Neither companies seem to be letting down and are still determined to come out on top in the race to claim the projected $7 billion Indian taxi market by the year 2020. Created in 2011 by two tech savvy entrepreneurs, goCatch has grown to become a multi-award winning free smartphone application that connects passengers directly with taxi drivers allowing customers to book a cab with certainty every time. Co-founded by Andrew Campbell and Ned Moorfield, the goCatch app has been supported by the NSW Department of Trade and Investment. goCatch has also formed partnerships and alliances with several prominent blue chip companies including Google, Microsoft, Nokia, PayPal and RIM. Australians have embraced goCatch with tens of thousands of drivers and passengers nationwide downloading the convenient booking service. goCatch is now one of the fastest growing apps in the country and is the clear market leader in the taxi sector. La'Zooz, a project that began in Israel but belongs to nowhere. Like Uber, Lyft or Sidecar, it’s an attempt to implement real-time ridesharing, but without the company. Using the same technology underlying the virtual currency Bitcoin—a distributed online ledger, or “blockchain”—the La’Zooz network would exist on the phones and computers of its community of users, rather than any central server. Rather than Bitcoin’s “proof of work” method of generating new tokens, which requires enormous computational power, La’Zooz generates new tokens—called “zooz”—with “proof of movement.” Basically, turn on your La’Zooz-enabled phone and drive. As you drive, you earn zooz tokens. Then, when you want a ride from someone else in the community, you can pay in zooz. Gett, the Israel-based ride-hailing app formerly known as GetTaxi, has a user base that pales in comparison to Uber and Lyft — it covers more than 100 cities globally, but only has a U.S. presence in New York City right now though its acquisition of Juno. The two have plans to expand into other cities and states in the not-too-distant future. Gett is appreciably more reasonable when it comes to pricing, though: the service never charges a premium during busy hours. Gett gets away with it by paying drivers a competitive hourly wage rather than a percentage of every fare, like Uber and Lyft. The company passes those savings on to riders. Curb is bringing professional taxi drivers into the 21st century by enabling a decentralised ride-sharing app which allows passengers to hail a network of 50,000 yellow cabs, in 65 US cities in advance. Fundamentally, Curb works much in the same way as Uber and Lyft: Hail a driver, and you’ll be whisked away to your final destination. Taxi driver are fully covered under an insurance policy and are paid based on how long the meter is running. Since your drives are metered, it’s easy enough to take detours at the passenger’s request. There’s no surge pricing option, but the fares are higher (than services offered by Lyft or Uber) and there’s a service fee paid up front to help recover costs. When it comes to how long you have to wait, you'll be waiting a little longer for a cab than you would for an Uber or Lyft (depending on the city you live in, of course). BlaBlaCar is a carpooling service connecting people looking to travel long distances with drivers going the same way. BlaBlaCar has raised a total of $335.2M in funding and is available in 22 countries including Europe and South America, which makes it a great option if you are traveling. This service connects drivers with empty seats with people who are looking for a ride. Users simply need to enter information about the departure and arrival destinations, and the times, and then pick a driver who is heading that way. Users can contact the drivers by calling or texting to book a seat. In order to use the service, users will need to have the exact change because this is a cash service. This is not really a ride for hire service since it is more about offsetting the trip’s cost. No surge pricing: The same low price every time, whether it's 2 p.m. or 2 a.m.